Arsenal remain the only team to have beaten the Clarets this calendar year as the Premier League new boys signed off from pre-season with a 1-1 draw against Real Sociedad thanks to Andre Gray's late strike. After scoring 25 goals in the Championship last term, which earned him a position in the PFA Team of the Year, the 25-year-old has built towards his first ever campaign in the top flight with nine goals in six appearances over the summer. Loan signing Jon Flanagan wasn't involved having confirmed his move from Liverpool just hours before kick off though Johann Berg Gudmundsson was handed his Turf Moor debut. And the Icelandic international looked lively on his first start, almost claiming his first assist with just 11 minutes on the clock. After Raul Navas sliced wide of his own upright from Matt Lowton's centre, and Ben Mee headed over from the resulting corner, the summer signing from Charlton Athletic slid a wonderfully incisive pass goal side of Navas to free Gray. However, the club's record signing failed to capitalise and a touch too many on the edge of the box allowed Hector Hernandez to recover and clear the danger. At the opposite end Real Sociedad teenager Mikel Oyarzabal, who netted a winner against Barcelona in La Liga at the Anoeta Stadium last season, saw his rasping drive from 25 yards beaten away by Tom Heaton. Igor Zubeldia failed to threaten the England international goalkeeper moments later when dragging a shot wide of the woodwork from distance before Jon Bautista rifled over right footed from deep inside the penalty area after being threaded in to a good position by full back Carlos Martinez. The breakthrough arrived just after the half hour and it was all too easy for the Spaniards. Dean Marney's foul on Carlos Vela gave the former Arsenal man the opportunity to swing a set-piece in to the box which was met by Rodriguez who, unchallenged, headed the ball back across Heaton and in to the far corner. The Clarets, just one week away from their Premier League opener against Swansea City, weren't at the races in the middle third of the opening half but responded after conceding. 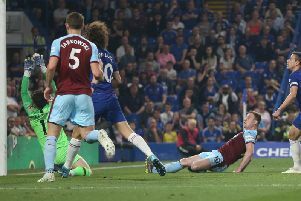 Micheal Keane looked certain to level matters when David Jones's corner was flicked towards the back post by Sam Vokes but the defender had the ball taken off his toe at the pivotal moment. Gray, who had scored eight goals in five pre-season fixtures ahead of the latest outing, could've added to his tally just before the interval but he struggled to wrap his left boot around the ball after Aritz Irribarria was caught underneath Vokes's flick on from Mee's clearance. The tempo didn't heighten after the break as the hosts failed to have an impact in the final third until the final few minutes. Sociedad's rearguard, including goalkeeper Ander Bardaji, weren't ever exposed until Gray worked his magic. Once Danny Lafferty guided a half-volley past the post, with Marney's initial attempt blocked on the edge of the box, it was Eusebio Sacristán's side that used the ball effectively and intelligently. Mee put a chance on a plate for Alejandro Sanz when misplacing a back pass but, with Heaton out of position and the goal gaping, the substitute somehow side-footed over the crossbar. The away side should have extended their advantage in the 65th minute when Heaton failed to take the ball off one-time Southampton forward Juanmi's feet and the substiute squared the ball to Bautista who beat the Burnley skipper with a measured strike but clipped the post. Sean Dyche's side looked like they were heading towards a first defeat in their preparations for the Premier League, until Gray arrived on cue. Last season's leading scorer benefited from a fortuitous ricochet off strike partner Lukas Jutkiewicz, who had earlier replaced Vokes, before cutting in to the penalty area on his left foot and shaping a delightful effort in to the far corner to make it 1-1.